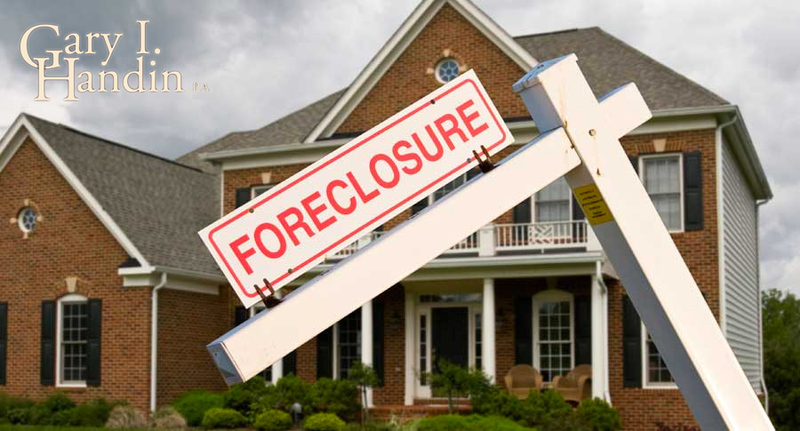 Facing foreclosure is a distressing prospect for any homeowner. Losing your home is something you’ll want to avoid at all costs, which is why you need an excellent lawyer by your side who has a wealth of experience in foreclosure defense and mortgage workouts. Even if you have consistently defaulted on your mortgage repayments, there are number of ways in which you can avoid foreclosure. Short sales, renegotiations and loan modifications, and deeds-in-lieu of foreclosure, are just a few mortgage workout options which you should consider and discuss with your lawyer. At Gary I. Handin, P.A., our foreclosure defense and mortgage workouts attorney will evaluate all your options and provide you with any legal support you need to ensure your interests are given optimal protection under the circumstances. Our attorney has over 40 years of experience and is renowned for his sound legal knowledge, attention to detail, and commitment to superior client services, and will go above and beyond in providing you with the foreclosure defense or mortgage workouts assistance you need to keep your home. Entering into a short sale is one way in which you can avoid foreclosure and its disadvantages. If your lender agrees to the arrangement, your home will be put on the market, and the money from the sale will be used to settle the loan. Either the lender will accept partial payment, or they will obtain a judgment for the remainder of the balance. Short sales allow you to sell your home without the social stigmatization which comes with foreclosure; your credit rating will not be as adversely affected; and your home will be sold at market value. While short sales clearly have their benefits; short sale is a long and complicated process which requires legal representation throughout. Contact the attorney at Gary I. Handin, PA., today to find out more about whether a short sale is the best option for you. We have years of experience in foreclosure defense and will provide you with excellent legal representation to ensure the best possible outcome for you in the circumstances. Depending on the extent of your debt and the willingness of your lender to negotiate, it may be possible to enter into a loan modification agreement. A loan modification agreement will allow you to restructure your mortgage and agree on new terms for repayment which are more manageable for you as the borrower. Short term repayment plans are also a good workout option for borrowers who have defaulted on loan repayments. If you are seeking a repayment plan or loan modification, it is best to have a lawyer negotiating with your lender on your behalf, who will ensure that your interests are protected and that the new agreement will be as favorable to you as possible. For professional, reliable, outstanding legal representation in a loan or repayment negotiation process, consult with Gary I. Handin, P.A. With years of experience in negotiating mortgage workouts, we are here to help you secure more favorable repayment terms. Reinstating your loan is another way to prevent foreclosure. Reinstatement involves the borrower paying the full amount needed to cure the default in one single payment, and then continuing to pay the loan as normal. Under Florida law, homeowners have a right to reinstate a loan should the lender decide to apply for foreclosure. Homeowners have a specific period within which to exercise this right, and the legal process to be followed is quite complex. If you want to exercise your right to reinstate your home loan, it is vital to consult a lawyer who can assist you throughout the reinstatement process and ensure that you comply with all the necessary legal requirements so that you don’t lose your home. The lawyer and staff at Gary I. Handin, P.A., are here to provide you with excellent legal representation so that you can successfully reinstate your loan and achieve peace of mind about the future of your home. Even if you’re not facing foreclosure, you may require asset protection for other reasons. Mortgages are not the only – or even the most common – type of loan which people enter into, and it may be the case that it is your movable assets, rather than your home, which are at risk. Whether it’s your home or other assets which are in need of protection, the attorney at Gary I. Handin, P.A., will provide you with whatever legal assistance you need to ensure your legal and financial interests are protected. Another way to avoid foreclosure is to voluntarily convey title to your home to the mortgage servicer in return for the discharge of your debt. This can be achieved by an instrument known as a deed-in-lieu of foreclosure. If your lender accepts the conveyance of title, they will also become responsible for all liens and judgments against the property. A deed-in-lieu of foreclosure will need to be drawn up by your lawyer, who will take care of all the legal details to ensure title is properly conveyed. If you are interested in discussing the benefits of a deed-in-lieu of foreclosure, consult with Gary I. Handin, PA., today. We will advise you on your options, draw up a deed-in-lieu of foreclosure, and ensure that your legal interests are protected throughout the transaction.